Oiva Toikka’s first glass birds, little flycatchers, first took off in the early ‘70s without much planning. Following an exhibition in 1975 at his glass factory Nuutajärvi in Finland however, the birds started to make a name for themselves. By the late ‘70s, a little golden, green-striped glass bird was specially created for a Christmas exhibition at the Nuutajärvi Museum which caught the eye of the magazine ‘Kotiliesi, which decided to promote it to their readers instead of the print that it usually offered. The bird was a success, and two years later Nuutajärvi launched another four birds. Very soon the glass Toikka birds developed a loyal following, becoming collectables and popular gifts. Every year since 1996 a new bird is added to the flock, and since the first birds of the early 70’s Oiva Toikka has designed over 500 birds. Professor Oiva Toikka is probably one of the most famous names in Finnish glass. He has won many national and international awards, among them Lunning Prize, Pro Finlandia Medal, World Glass Now 85 Award, Kaj Franck Design Prize and the Prince Eugen Medal. He has been associated as an artist and designer with Iittala and Nuutajärvi for over fifty years. As well as designing the glass birds, Toikka is well known for his popular tableware that he designed in the 1970s that was in production for decades. Though one of the company’s most successful designers, he has always seen himself as first and foremost an artist. As long working in the theatrical business as a designer and artist; working in the performing arts designing stage settings and costumes, Professor Oiva Toikka is especially famous for his glass artistry and is most renowned for his glass birds that have become a popular collectable sought by collectors and bird lovers. Toikka takes much of his inspiration from nature, combining this with his wide experience of glassblowing and artistry. The combination of their beauty and high quality craftsmanship make Toikka glass birds a wonderful gift for all occasions. Iittala’s catch phrase is ‘Timeless design since 1881’and this is the place to come for durable, sustainable and stylish everyday items that have been created by top designers from around the world. 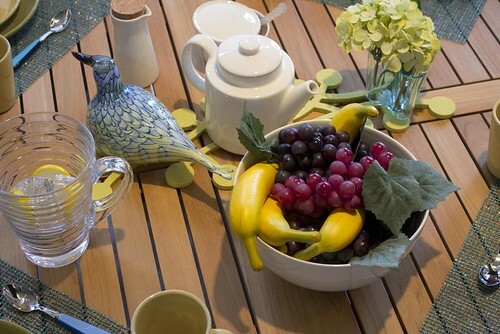 The emphasis is on top quality design that creates durable, versatile and practical objects that also are pleasing to the eye, whether for eating, drinking, cooking or making the home look good. 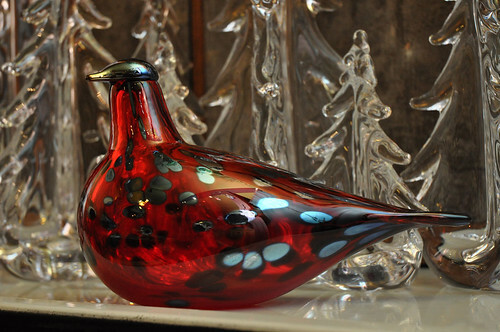 The birds are made in Finnish Nuutajärvi Glass Factory, 160 kilometres from Helsinki. Founded back in 1793, it is the oldest glass factory in the country and now functions to produce glass artwork like the Toikka birds. The Glass Village is a centre for glass artists, and the Wetterhoff Glass School trains future glass masters in the skills of glass craftsmanship. The Factory Museum and Glass Gallery offer the opportunity to see examples of the birds along with other beautiful glass objects produced by the factory. The birds themselves are made from mouth-blown glass, with three to five craftsmen contributing their efforts to produce each unique bird. The brilliant colours come from the glass, not paint. Oiva Toikka exploits the qualities of glass – its transparency, opaqueness and colours, using filigree to depict plumage. Every bird is signed with “O. Toikka Nuutajärvi” to prove its authenticity. As well as birds, Toikka also has designed highly collectable exquisite limited edition glass eggs. Like the birds, these are mouth-blown, hand-signed and numbered. For admirers able to visit Finland, every October for three days, the Museum of Glass goes to the birds. Oiva Toikka designs a new, limited-edition bird for the museum that is available for purchase at the museum’s shop. In 2011, a limited-edition Woodpecker was designed. At the same time, there are displays of Toikka’s birds, bird-making demonstrations along with bird-related art activities and live bird visits from the local zoo. For those unable to visit the Glass Factory and Museum, it is easy to start your own collection of the beautiful Iittala birds range. Image Credits: Dinner Series and Dinner Series. This is a great idea. They are so lovely! Those are definitely lovely, great for a collector or someone who loves to decorate their home with unique knick knacks…thanks for the idea! I can imagine a collection would become quite extensive. There are so many variations of color and pattern possible! Oh she makes some very beautiful things!! Oh my goodness….those are absolutely stunning!! I love these glass birds. Thanks for sharing. Those are really beautiful and so unique! Those are so neat! Definitely a good conversation piece! Really pretty, love blown glass. These are absolutely gorgeous! I love birds! Lovely. I didn’t know about these until I read this post! These are so beautiful 🙂 My sister collects bird items and she would just love these! They are beautiful! Very unique. Wow! I love these! We live not too far from the Blue Bird of Happiness art studio. If you ever get a chance to tour it, the grounds are beautiful! Love these… can I move to your town? They are so pretty. One would look fantastic on my window ledge! Those would look great tucked into my little patio garden. I have never seen such glass birds as beautiful as these. These are so cool i wish I had a few of them. i love blown glass but its usually so expensive!! That is so gorgeous and unique. My mother would LOVE this! Thanks for sharing. Such sweet pieces. We’re huge bird fans so we’d love these! Those are beautiful gift ideas. These are so pretty! I have a few glass chickens! Gorgeous! I would totally collect these. Never seen those before. Really beautiful. My sister is a photographer and does alot of nature photos. She especially loves birds and flowers. I may have to buy one of these for her for xmas, they are beautiful! These are so very beautiful and unique! Just gorgeous. My mother in law would love these – she loves blown glass.